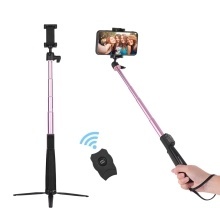 Selfie Stick & Tripod Monopod: 2 in 1 selfie stick tripod, can be used as handheld selfie stick to link with your smartphones, also can be used as a stable tripod on the desk or floor, free your hands to take photos by yourself or to watch videos. BT Connection: With a wireless remote control, can be linked with your phones to control shooting, one key to control, With unique memory function, once paired, the remote will connect automatically next time, the remote will automatically go into sleep mode to save power when inactive for over 5 minutes. easy and convenient to use. Adjustable Angles & Extendable Length: With a small ballhead, the angle of shooting can be adjusted according to your needs, the selfie stick can be extended directly with maximum length to 717mm, free to switch between horizontal and vertical mode, so practical. Wide Application: The mobile phone holder can be stretched to fit your mobile phone, compatible with phones between 45-100mm, such as iPhone X/ 8 Plus, Huawei, Samsung etc, with 1/4inch screw on the ballhead. Durable: With high quality aluminum alloy extendable stick, anti-skid mat is provided at the bottom of the bracket, more durable and stable. Portable: The minimum folding length is only 20cm, net weight only 219g, small size and lightweight, won&apos;t take up much space in a bag, especially suitable to carry for your travel. Application: Phones between 48-100mm, such as iPhone X/ 8 Plus, Huawei, Samsung etc. APP Camera 360 is compatible with your device if your smart phone cannot be connected. The insulation paper of the BT remote control needs to be removed when first used. The phone and camera showed in the pictures are not included.